Thu: 8 a.m. - 2 p.m. Fri: 9 a.m. - 6 p.m.
Thu: 8 a.m. - 7 p.m. Fri: 8 a.m. - 7 p.m.
Mon: 8 a.m. - 5 p.m. Tue: 8 a.m. - 5 p.m. Wed: 8 a.m. - 5 p.m. Thu: 8 a.m. - 5 p.m.
Fri: 8 a.m. - 5 p.m. or 2 p.m. - 7 p.m.
A founder and an owner of the Wichlińscy Aesthetic Dentistry and Implantology Clinic. A graduate of the Faculty of Medicine, Department of Dentistry of the Jagiellonian University Medical College in 1999. In 2010 she completed the specialization in dental prosthetics with distinction. A founder and an owner of the Wichlińscy Aesthetic Dentistry and Implantology Clinic. A graduate of the Faculty of Medicine, Department of Dentistry of the Jagiellonian University Medical College in 1999. During the period from 2001 to 2008 an assistant at the Department of Dental Surgery of the Jagiellonian University Medical College conducting the clinical classes with dental students. Medical Director of the Wichlińscy and Aestetic Dentistry and Implantology Clinic. A student of the Faculty of Medicine, Department of Dentistry of the Jagiellonian University Medical College during the period from 1999 to 2004. In the years from 2003 to 2004 he belonged to the Student Scientific Club at the Department of Dental Surgery. Mon: 8 a.m. - 5 p.m. Tue: 8 a.m. - 5 p.m. Wed: 8 a.m. - 5 p.m.
Thu: 8 a.m. - 5 p.m. Fri: 8 a.m. - 5 p.m. or 2 p.m. - 7 p.m.
A graduate of the Faculty of Medicine, Department of Dentistry of the Jagiellonian University Medical College in Krakow. She specializes in conservative dentistry, endodontics and prosthetics. A graduate of the Faculty of Medicine and Dentistry of the Jagiellonian University in 2013. She was a member of the management board of the Polish Society of Dental Students of the Krakow Branch. 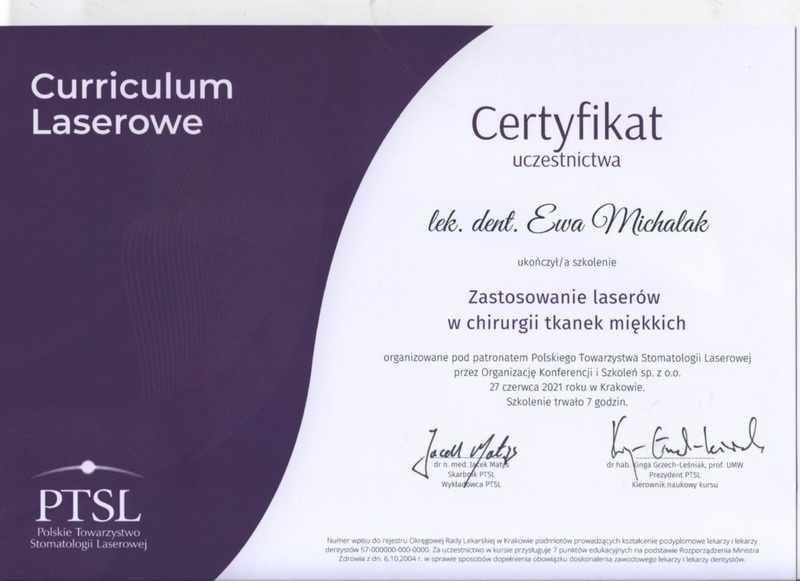 She has completed the course of the specialization training in orthodontics at the University Dental Clinic in Krakow. She is a member of the Polish Orthodontic Society. At the dental office she specializes in prophylaxis and conservative dentistry. A graduate of the Karol Marcinkowski Medical University in Poznań. She has completed a number of courses in conservative dentistry, endodontics and surgery. Mon: 8 a.m. - 2 p.m. Tue: 8 a.m. - 7 p.m. Wed: 8 a.m. - 3 p.m. Thu: 8 a.m. - 2 p.m.
Mon: - Tue: 8 a.m. - 1 p.m.
A graduate of the Faculty of Medicine, Department of Dentistry of the Jagiellonian University Medical College in Krakow. He was a member of the Polish Dental Society during the studies. He specializes in endodontics and conservative dentistry. A graduate of the Faculty of Medicine of the Medical University in Lublin. She specializes in conservative dentistry, endodontics and pedodontics. A graduate of the Faculty of Medicine of the Medical University in Białystok. She specializes in conservative dentistry and pedodontics. Mon: 2 p.m. - 7 p.m. Tue: 8 a.m. - 2 p.m. Wed: 2 p.m. - 7 p.m. Thu: 8 a.m. - 7 p.m. Wed: 2 p.m. - 7 p.m. Thu: 8 a.m. - 6 p.m.
A graduate of the Faculty of Medicine, Department of Dentistry of the Jagiellonian University Medical College in Krakow. She specializes in conservative dentistry. A graduate of the Faculty of Medicine of the Medical University in Lublin. During the period from 2016 to 2018 an assistant at the Department of Dental Prosthetics of the Jagiellonian University Medical College conducting the clinical classes with dental students. She specializes in prosthetics, conservative dentistry, dental surgery and pedodontics. Carefully selected personnel is a guarantee that each dentist, stomatologist from the Wichlińscy Aesthetic Dentistry and Implantology Clinic is a qualified and experienced specialist. At Gorlice Clinic services are provided by a maxillofacial surgeon, dental prosthetist, an orthodontist. The Dentistry Clinic uses certified implants applied.